This morning, I went for some coffee in Leederville. I started off at Greens and Co. Greens is a bit of an old faithful – I know that it’s good coffee, in a good place. 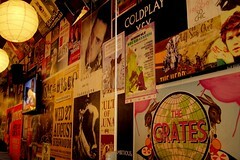 Greens is very funky, with concert posters all over the walls. At times, it can be very busy, making it hard to find a place to sit. However, this morning, it was mostly empty, and I could take my choice of couches, or tables. Ended up going with the couch, as I was expecting a few friends to come. I started with a cappuccino, which was very well made. It had a nice consistency of foam, and was a good strength coffee. A little while after that, I had a short macchiato. This is something that I’ve only just got into, so I’m still getting used to the tastes. However, the coffee was nice, nothing overpowering about it. The interesting thing for me came just after this. We moved to a new cafe, 50ml, which has opened up next to San Churros, taking over the shop that Gloria Jeans used to have. If Greens is funky, 50ml is wacky. The lights are covered by strainers, there’s an eclectic mix of artwork on the back wall, and the seating and tables seem to have been collected from various op shops from around Perth. For example, the table where we sat was obviously an old school table – you know the ones, wooden with the indentation for your pencil, and a lift up lid for all your books. My chair however was even more weird. The back seemed to be something that seemed more at home in a shower than a coffee shop. But enough about the shop, the coffee was very interesting. I may not have noticed so readily had I not just had one, but the short macchiato that I had was very different. The coffee was very strong – it was the first thing my friend and I noticed. However, it wasn’t overpowering, and didn’t leave a bad taste in the mouth. It was in fact very nice, however people who aren’t fans of strong coffee may not appreciate it. So if you’re in Leederville, make sure you check out one of these coffee shops and enjoy the vibe. Thanks for the heads up -is a coffee crawl the Salvo version of the you-know-what crawl? Next Next post: Happy 11/11/11!